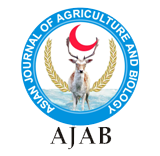 Asian Journal of Agriculture and Biology (AJAB) is an online, open access, peer reviewed journal published quarterly by Life Sciences Society. It publishes original research articles, short communications and review articles on agricultural (including environmental and animal sciences) and biological sciences. AJAB is recognized by Higher Education Commission (HEC) and indexed in Clarivate Analytics (ESCI, MJL), SCOPUS, CAB Abstracts, Index Copernicus, DOAJ, ROAD, Ulrichsweb, CNKI (China), Google Scholar and Pakistan Science Abstracts (PSA). The journal is read and abstracted internationally.